Be invited to help us with writing documentation! We are currently in the works of a SFZ(2) format based sampler engine, as additional powerful sampler engine for LinuxSampler. 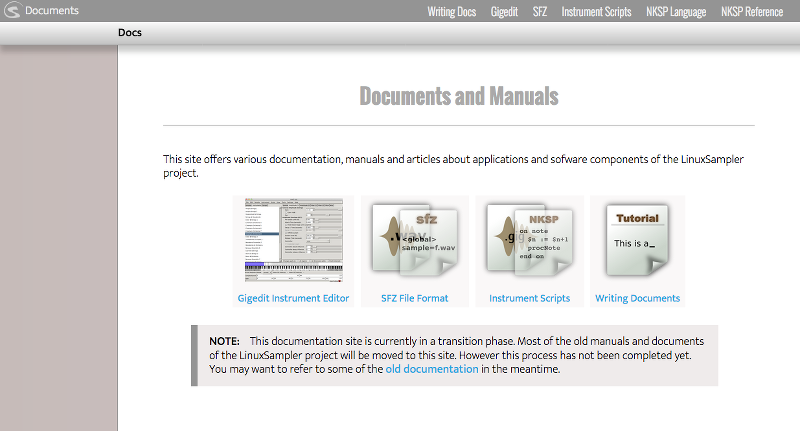 As there is currently no official document defining the so called SFZ version 2 format, we created our own SFZ2 reference document, reflecting the format and the progress of implementation in LinuxSampler's Subversion developers version. This reference document is currently maintained by Anders Dahnielson. Windows HOWTO LinuxSampler quickstart guide for the MS Windows operating system. OS X HOWTO LinuxSampler quickstart guide for the Apple OS X operating system (Note: Completely out-dated!). Debian HOWTO Guide for how to build optimized Debian packages of LS & friends for your specific machine. Debian HOWTO (German) Another guide for Debian on an external site, this one in German language. Windows Build HOWTO Guide for how to build libgig, linuxsampler and gigedit for Windows by using MSYS. This is our graphical instrument editor based on the Gtk toolkit. It can be used stand-alone or in conjunction with LinuxSampler. Read the Gigedit Quickstart for a short tutorial. Please notice that this quickstart document is automatically generated from CVS and thus might reflect features and behaviors only available in the very latest, bleeding edge development version of gigedit from CVS. Note: The gigedit documentation is currently completely out-dated! JSampler is an opensource, platform-independent, GUI front-end for LinuxSampler, written entirely in Java. Read the JSampler manual for more information. For information about using Fantasia with Miditzer in Puppy Linux VTPO read this HOWTO. libgig is a C++ library used to load and modify instrument files, supporting the Gigasampler / GigaStudio file format, SoundFont file format, KORG file format, AKAI disk image format and the DLS (Downloadable Sounds) file format. If you're a developer and might want to use libgig, here is its API documentation (automatically updated from SVN). liblscp is C library as convenient wrapper around the LinuxSampler Control Protocol. If you're a developer and might want to use liblscp, here is its API documentation (automatically updated from SVN). The following documents define the LinuxSampler Control Protocol, a network protocol with which LinuxSampler can be controlled locally as well as remotely. As this is a simple ASCII based protocol it's possible to write a frontend for LinuxSampler in any programming language and GUI library. There's still a big demand especially for a Gtk and ncurses based frontend, so be encouraged and let us know if you wrote a frontend for LinuxSampler! LSCP draft TXT, HTML, XML unreleased Very latest draft of the protocol (which usually reflects the latest development state from SVN or may even not be implemented yet). LSCP 1.7 TXT, HTML, PDF, XML 2015-07-15 Protocol specification of latest LinuxSampler release (v2.0.0). LSCP 1.6 TXT, HTML, XML 2014-01-10 Protocol specification of a SVN LinuxSampler version (1.0.0.svn25 - svn r2500). LSCP 1.5 TXT, HTML, XML 2011-06-24 Protocol specification of a SVN LinuxSampler version (svn r2188). LSCP 1.4 TXT, HTML, XML 2009-07-31 Protocol specification of old official LinuxSampler release v1.0.0. LSCP 1.3 TXT, HTML, XML 2007-12-06 Protocol specification of ancient LinuxSampler release (0.5.1). LSCP 1.2 TXT, HTML, XML 2007-10-15 Protocol specification of ancient LinuxSampler release (0.5.0). LSCP 1.1 TXT, HTML, XML 2006-11-25 Protocol specification of ancient LinuxSampler release 0.4.0. LSCP 1.0 TXT, HTML, XML 2005-07-17 Protocol specification of ancient LinuxSampler release 0.3.3. The protocol will be extended from time to time. You may look at the features site to see which control commands are already implemented and which are not. Optionally you can also use a graphical frontend like QSampler one time to setup a working sampler session for your needs and save it. Because you have to know that the files saved by our frontends are actually pure LSCP scripts, thus you can i.e. use those files simply with the mentioned netcat command from above to setup the sampler session without a frontend. The next example is a bit more complex. It shows how to setup a more realistic sampler session, handle routing of MIDI input channels, handle routing of audio channels, it uses JACK again as audio output driver, but creates the JACK client with four output channels instead, it creates two sampler channels, loads two different instruments on those two sampler channels and alters the audio channel routing so that the two output channels of sampler channel 1 are routed to the first two JACK output channels and the two output channels of sampler channel 2 are routed the second pair of the JACK client's output channels. That way you could e.g. record the output of those two sampler channels independently or apply independent LADSPA effects on it. SET MIDI_INPUT_PORT_PARAMETER 0 0 ALSA_SEQ_BINDINGS="64:0"
For a detailed description about LSCP read the LSCP reference. Be welcome to ask details on the mailing list.